Canadian Pacific’s Shuswap Subdivision stretches from the picturesque town of Revelstoke, British Columbia, nestled between the Rocky and Monashee mountain ranges on the mighty Columbia River, to Kamloops on the South Thompson River, a distance of 129 miles. 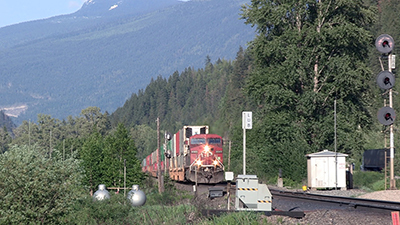 This video shows over twenty-four hours of action between Revelstoke and Notch Hill – a distance of seventy-nine miles in May of 2018. This includes the spectacular passage through Eagle Pass just west of Revelstoke and the lakeside running beyond the summit, and the long climb for heavy westbound unit trains up Notch Hill on the new, low grade line which includes a spectacular horseshoe curve. CP’s Shuswap sub is part of CP’s transcontinental main line to Vancouver, B.C. and sees many stack, manifest, sulfur, potash and grain trains, along with 21,000 ton coal trains from southern British Columbia that join the main at Golden on the Columbia River, ninety-five miles east of Revelstoke. 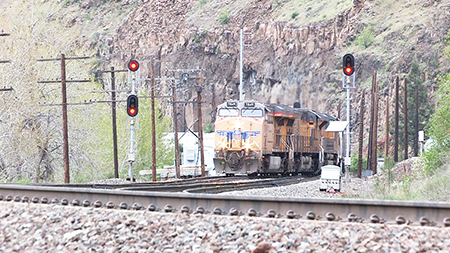 Most of these trains utilize distributed power with locomotives spread out at up to three points in the train. Two disk set. Length = 2 hours, 41 minutes. DVD can be watched with or without narration. This program shows the trains and operations on Canadian National’s transcontinental main line west of Edmonton, Alberta on their Edson Subdivision between Edson and Hinton. CN is arguably the western hemisphere’s leading railroad and usually has the lowest operating ratio of any class I railroad in the U. S. or Canada. The tonnage on this line and on the CN system has grown more than fifty percent in the last decade, by far the greatest increase of any class one railroad in North America, and CN runs some of the longest and heaviest freight trains in North America west of Edmonton. This program shows twenty-four hours of action on CN’s Edson Subdivision between a point just west of Edson and Obed, near the summit of the climb out of the McLeod River Valley at Edson. Obed Summit on the ridge between the McLeod River at Edson and the Athabasca River at Hinton is nearly as high as the summit of Yellowhead Pass through the Rockies west of Jasper and the ruling grade for the usually heavier westbounds is the same – four tenths of a percent. The sound of a thirty thousand ton train grinding its way to the top of Obed Hill is awesome. This well-engineered track is traversed by a continuously expanding number of containers out of the Ports of Vancouver and Prince Rupert, and the train count continues to grow on this busy and at times congested line. At the time of our visit CN was short of power and leasing everything they could get their hands on. So come along with us as some of the longest and heaviest trains on this continent growl up the grade out of the McLeod River Valley in May of 2018 on CN’s Edmonton to Jasper Main. Two disk set. Length = 3 hours, 7 minutes. This DVD can be watched with and without narration. Where the winds blow could easily be the title of this program. Large temperature gradients between the west and east ends of the Columbia River Gorge drive the prevailing westerly winds, especially on warm days. And when we were on standing on the basalt cliffs lining the north side of the Gorge looking down on the tracks, the wind was certainly blowing. The town of Bingen, Washington where we spent the night is in the heart of this only, near sea level gap in the Cascade Mountains and is almost right across the River from Hood River, Oregon, the windsurfing capital of the World. BNSF’s former Spokane, Portland and Seattle main line along the north bank of the Columbia hosts almost all of BNSF’s westbound manifest and loaded unit trains bound for all the major cities in the Pacific Northwest from Portland to Vancouver, British Columbia. And with the number of crude oil and export coal trains growing along with as many as nine grain trains in twenty-four hours, the unit train count on this line can be staggering. 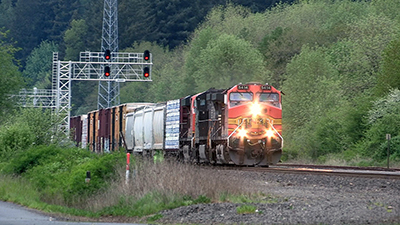 “BNSF in the Columbia River Gorge” shows over twenty-four hours of BNSF and Amtrak action in the scenic heart of the Columbia River Gorge, both sides of Bingen on BNSF’s Fallbridge Subdivision in May of 2018. This video is one hour and thirty minutes in length and can be watched with or without narration. 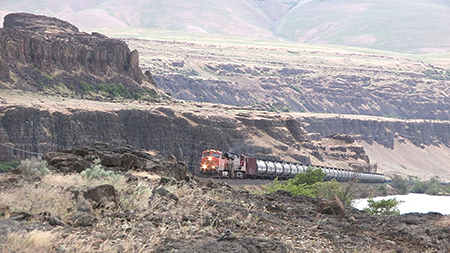 As the Oregon Railway and Navigation Company climbed out of the Columbia River Valley near present day Hinkle while on its trek towards meeting the Union Pacific Railroad at Huntington on the Snake River, it encountered the Blue Mountain range in northeastern Oregon. The track that it constructed through this land of snow-capped mountains, sagebrush covered desert, and lush mountain valleys remains one of the Union Pacific’s greatest mountain challenges as trains up to 20,000 tons conquer three separate summits on their way to Portland, Oregon and Seattle, Washington. And the most difficult and westernmost of these climbs is the line through the main Blue Mountain range west of La Grande, Oregon, the subject of this program. While multiple helper sets used to roam these grades, today this line is ruled by radio controlled slave units with the power distributed at up to three points in the train. This DVD shows over 24 hours of ear-splitting action on the two percent grades of UP’s La Grande subdivision in the Blue Mountains in May of 2018. This DVD is two hours and twelve minutes in length and can be watched with or without narration.